The MKR CAN shield allows a MKR board to connect to the CAN bus using the MCP2515 SPI to CAN chip. 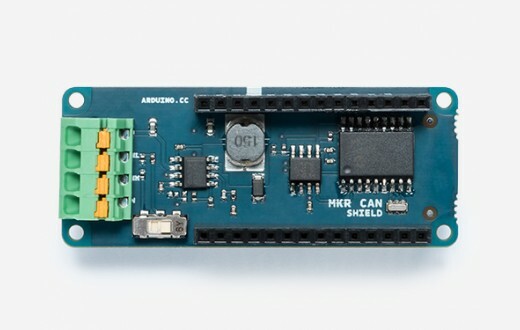 The Arduino MKR CAN Shield uses the MCP2515 chip by Microchip. This chip is an industry standard and therefore you find already in our Library Manager a library to mange the chip and communicate over the CAN bus, with some useful examples. Open Library Manager and search MCP2515. The switch close to the CAN bus connector allows to enable or disable the termination resistor. This shield is compatible with the MKR family of Arduino boards. It uses Pin 7 to generate an interrupt when there is data coming from the CAN bus.